Do you know what a Bronze turkey is? What about a Kelly Bronze? No? 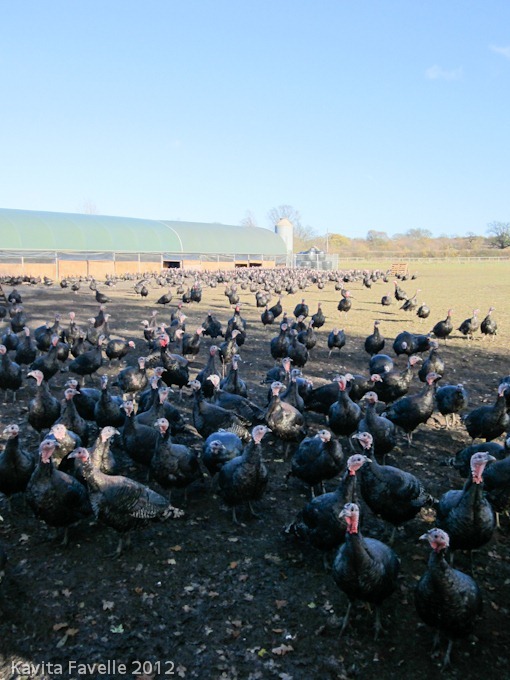 Neither did I before a recent visit to the Kelly Turkey Farm in Danbury, Essex. None of us ever developed a taste for turkey though. My sister and I probably first encountered it in festive school dinners; my parents in similar meals served in the canteens of the hospitals where they worked. None of us could understand the obsession with this bland, dry white meat that had to be soaked in gravy and cranberry sauce to make it palatable! But turkey wasn’t always like this! In the Middle Ages (from the 5th to the 15th centuries), the eating birds of choice were peacocks and swans for the royal court, goose for those who could afford it and chicken for those who couldn’t. Spanish traders bought the turkey to Europe from Central America back in the 1500s, and they quickly became hugely popular, particularly for Christmas. These exotic birds had far more meat on them than chickens, and were tastier than other larger birds such as swans or peacocks. At first, the import trade thrived, but it wasn’t long before British farmers started breeding turkeys and were soon raising many thousands each year. These farms concentrated in East Anglia, where there was plenty of grain to feed the turkeys and easy access to a large and rapidly growing consumer base, in London. By the early 1700s, farmers would make the annual turkey walk from their farms in Norfolk to London, taking about 250,000 birds to the London markets. Drivers left the farms in August, walking flocks of 300 to 1000 birds each. 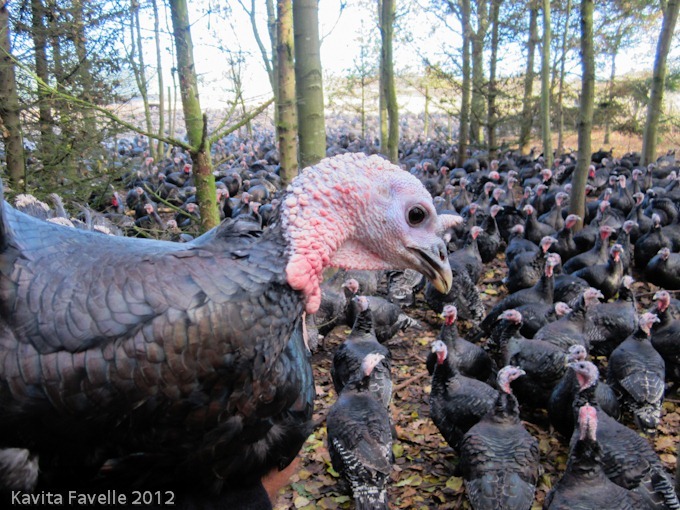 The turkeys fed on stubbles (the stubs of stalks left in the fields after the crop has been harvested) and at feeding stations along the route. To get the best sale price, it was essential not to rush the turkeys, or they would lose too much weight, so the turkey walk took a good couple of months. Cookery books of the period, by authors such as Kenelm Digby, Hannah Glasse and Mrs Beeton, shared as many recipes for turkey if not more, than for chicken, goose or duck. Despite the impressive numbers, turkey was expensive and a whole bird was affordable only to the wealthier upper classes. But street vendors sold turkey in pies or pieces, and hence it became popular with the wider population too. 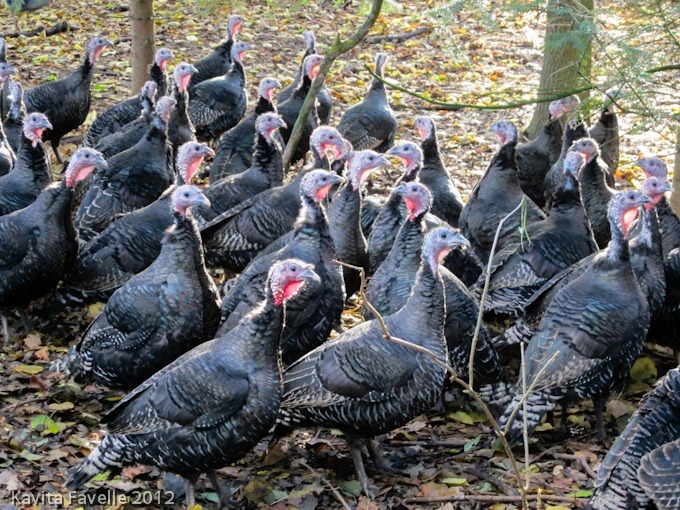 Like the original birds first exported from Mexico (both wild and domesticated), until relatively recently the turkeys farmed in the UK were all bronze – that is to say they were covered in black feathers tinged with a beautiful bronze sheen. In the decade following the second world war, commercial broad-breasted bronze varieties were crossed with a white-feathered breed to produce broad-breasted white-feathered breeds. The white feather colour meant that the pin feathers and shafts were far less visible after the carcass had been processed and dressed, and the broad breasts gave plenty of meat. Customers, and the supermarkets (which were becoming more prevalent during this period) appreciated these characteristics and virtually all commercial turkey farmers switched from traditional bronze to white turkeys. At around the same time and into the 1960s, agriculture went through a period of genetic selection programmes, often using new scientific techniques, and intensive farming methods became commonplace. Consumer tastes called for larger, heavier birds with more white meat and farmers favoured birds that grew to saleable size quickly and which grew larger than traditional breeds. Indeed, this was much the same story that saw rare breed pigs (often slow to mature, and with dark black hairs on their skin) replaced in popularity by faster growing, pale haired breeds. Flavour was overlooked in favour of more commercial qualities. White turkeys continue to be selectively bred for size and speed of growth, and the average weight has increased by 100% every decade for the last several decades. Indeed, many of these varieties are now unable to mate naturally, are too heavy to be able to move easily and often suffer from heart problems due to their extreme weight. By the 1970s, very few farmers commercially bred bronze turkeys, and only a few very small flocks remained across the UK. Derek Kelly, having worked in the turkey farming industry for some years, wanted to start his own business selling higher quality turkey. He believed in slower and longer maturation, careful selection of feed, traditional dry-plucking and hanging the carcasses to develop flavour and he was convinced that people would pay a premium for a better product. When he and wife Molly first set up their business in 1971, he initially bred white turkeys, but found it hard to market the differences to consumers. In the early ’80s Derek travelled around the UK and purchased most of the remaining flocks of bronze turkeys he could find, which amounted to less than 300 birds. These he crossbred together for five years, to broaden the genetic base, after which he began to group them into breeding families for different end weights and other characteristics. To produce the best finished product possible, Kelly not only selected for flavour, but also developed an end to end process. The birds are raised free range. They are fed a fixed formulation feed (not whatever is available for the best price at the time) and are drug free. They are matured slowly and for longer. When they are ready, they are dry processed and then hung for two weeks. These quality bronze turkeys quickly gained a reputation. The first to stock them was David Lidgate in London. Delia Smith made a visit to the farm in 1989 and recommended Norfolk Blacks in one of her cookery books at the time. More recently, Jamie Oliver has been a firm fan and supporter. They are not alone. 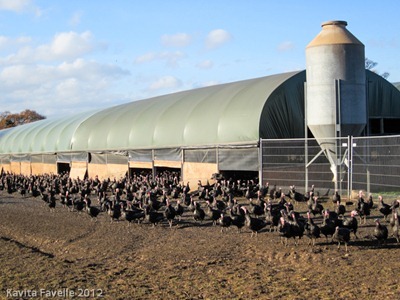 Today, Kelly grow 140,000 turkeys for the Christmas trade, with a small number also on sale for Thanksgiving. As well as their original farm in Essex, they have two sister companies in Holland and Germany and have just launched in the United States this year. Our tour of the farm was conducted by Paul Kelly, current MD and son of Derek and Molly. He told us that demand in the UK remains heavily seasonal, with virtually all their sales coming in November and December. But of course, their business runs all year round. From January through to March, they selectively breed stock. April through to August is for egg laying, brooding and hatching. From August to November the poults are raised to maturity. And in November and December, the turkeys are dry-processed, hung and prepared. We were particularly tickled to learn that after the dry plucking (with a device akin to an epilator) the turkeys are waxed to remove any remaining feather shafts. Yes, really, just like in a beauty salon! 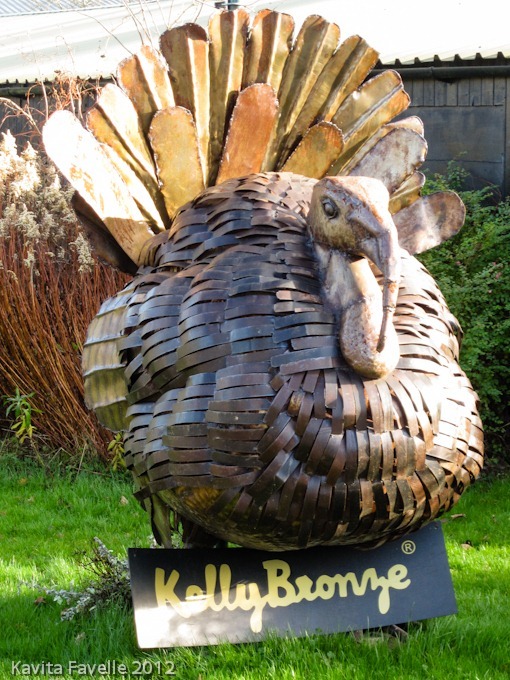 The Kelly Bronze turkeys are sold to both catering and individual consumers, directly and via butchers. Although mail order is available, many local buyers love to come to the farm to collect their Christmas birds. Although Kelly breed stock for their own farms, they also sell hatching eggs and poults to other farmers, through their FarmGate Hatcheries business. 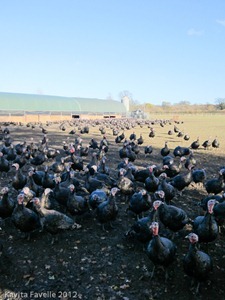 Some of these farmers choose to breed turkeys along the same lines as Kelly but some decide on different feed formulations, some don’t have the space or facilities to raise the birds free range, some use the more common wet-plucking to process their birds and many won’t hang the birds after processing. In all cases, these birds are bronze turkeys, but are not Kelly Bronze turkeys, regardless of the fact that they are raised from the same breeding stock. But Kelly also operate a franchise of 28 farmers who have signed up to follow their exact processes, and these birds are sold under the Kelly Bronze brand. 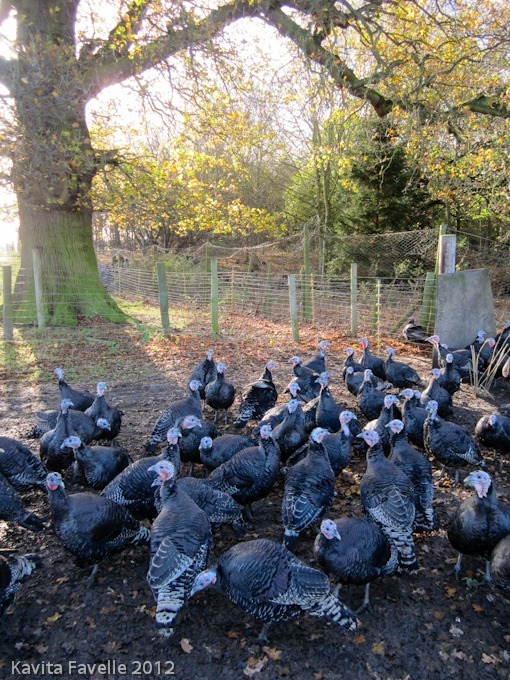 Of course, Kelly Turkey Farms are not the only company to produce high quality free range bronze turkeys fed on good quality feed, allowed to mature for longer, dry plucked and hung for flavour. The great news is that, even in a recession, consumers are willing to pay more for really good meat, even if that means they eat meat less often. In recent years, Kelly Bronze have been moving towards a more natural style of free range farming, by giving the turkeys the natural cover of woodland. 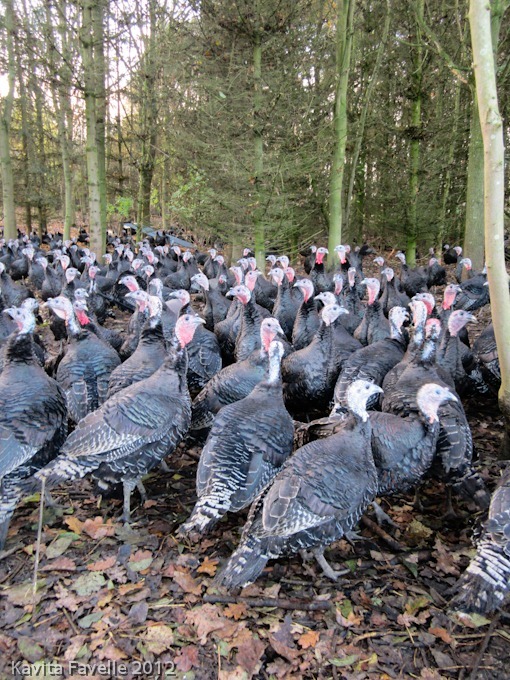 Turkeys can cope with rain and fairly cold temperatures, but absolutely hate the wind. They seem to love being able to range freely under the cover of trees, as we saw when we visited the main turkey farm. As it was a very windy day, most of the birds were either huddling in the barn or in the woodland nearby. 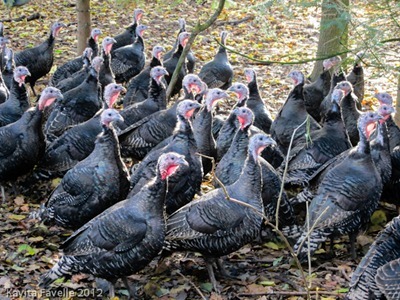 For farmers, the advantage is that they may be able to raise free range turkeys on wooded areas of their properties that are not suitable for other types of farming. After our visit to the turkeys, it was time for lunch. 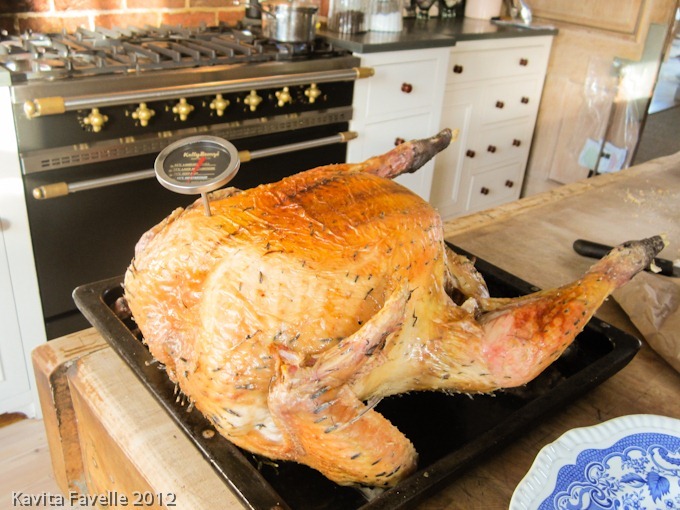 Paul mentioned that one of the problems they face, when trying to show people who think they don’t like turkey – people just like me – how good it can be, is that the cooking times recommended by many supermarkets and suppliers are simply too long and lead to an already poor quality bird drying out and becoming even more tasteless. Turkey is far less forgiving of being overcooked than most meats. 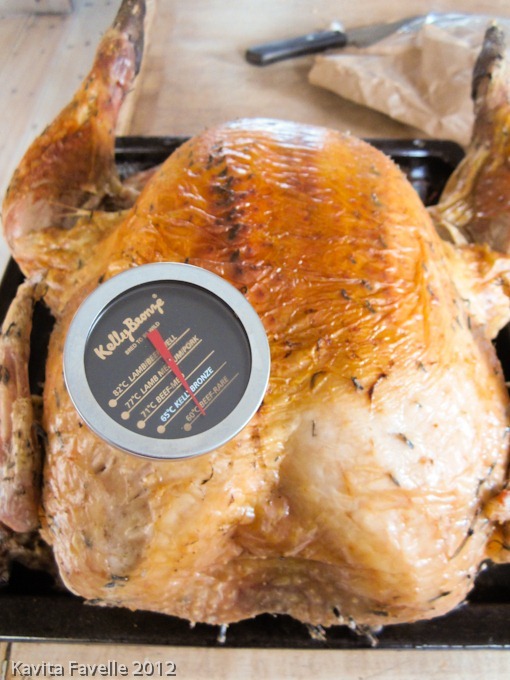 The Kelly Bronze turkeys are sold with cooking instructions and a meat thermometer to ensure that they are not over cooked. 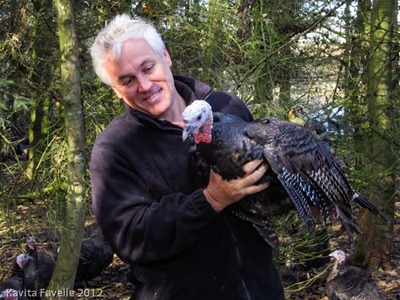 Paul has won turkey carving competitions (who knew?!) during which he was challenged to carve a turkey neatly, into a given number of exactly equal portions of both white and dark meat, faster than anyone else. 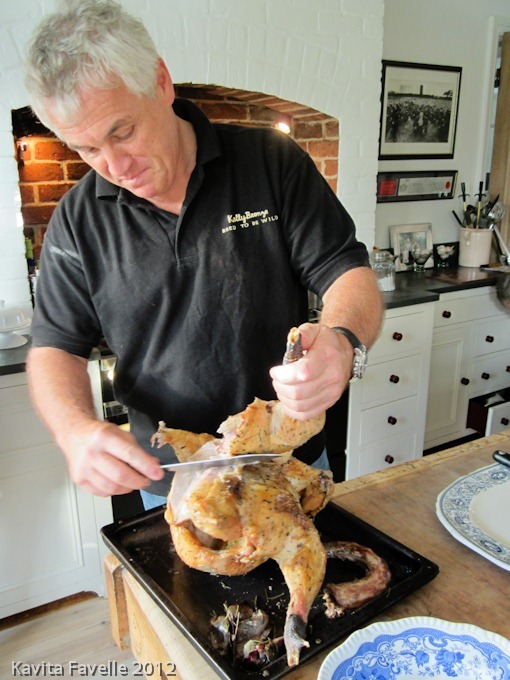 Instead of trying to carve the breast in situ, Paul cleaves the breasts away from the carcass, making it much easier to neatly slice them on the plate. And because Kelly Bronze turkeys have the leg tendons removed during processing, it is easy to carve the dark meat from the legs too. Another tip he shared was that, using his recommended cooking method and time, the skin will not achieve the perfect crunch. Leaving the bird in the oven until the skin crisps up will result in an overcooked bird. Instead, he showed us his way round this; he removed the skin in sheets, placing the pieces onto a baking tray and popping them into the oven for a further 15-20 minutes. Sprinkled with salt, these became crunchy morsels of turkey crack! 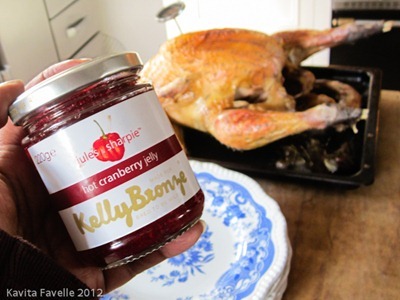 Once carved, the turkey, already moist and full of juice, was further dribbled with some of the cooking juices from the pan and served with fresh bread, a big bowl of salad and some very good hot cranberry jelly. Made by Jules & Sharpie, it has a mild kick of chilli in it which even I (chilli wuss) really enjoyed. So what did I think? Well, as I had hoped once I learned more about the impact of breed, farming and processing methods, Paul’s Kelly Bronze turkey tasted wonderful. The meat was full of flavour, not just the dark meat, which is always my favourite part of a bird, but the breast meat too. It was a world away from the cheap mass catering turkey meals I’d been put off by in the past. Of course, Paul acknowledges that Kelly Bronze turkeys are expensive and, even at Christmas, not everyone can afford them. He recommends buying the best you can afford and then making the most out of it by investing in a meat thermometer to ensure that you don’t over cook it. I would also point out that, per kilo, it’s about the same price as British bone in rib of beef. As turkey will be on our table this Christmas, I’d love to hear your ideas for great dishes to serve alongside and your best ideas for using leftovers! Kavey Eats was a guest of Kelly Turkey Farms. Thank you for a lovely day. 10 Comments to "Going A Gobbling: A Visit to the Kelly (Bronze) Turkey Farm"
What a lovely read. Very informative. I actually quite like turkey but I think is because mum is such a good cook! I’ve never had enough people over for Christmas to warrant cooking a whole one myself but I’d live to give it a try. One of the things I look forward to the most is left-over turkey and coleslaw sandwiches! I love breaded chicken and coleslaw, one of my fave combos. Shall try turkey and coleslaw! Very good. So much better flavour! I didn’t know about the turkey walk – how funny! I think much like the goose walks of similar period. I don’t know if they tarred the turkey feet like they used to for the geese, to make them hardier for the walk…? Thanks Nicky, good to know. I missed this post the first time round – caught up with it thanks to your 2012 round-up! I’ve driven past their farm many times and always wanted to visit, you lucky thing you. Drop them a line and organise a visit, bet they’d be happy to have you come and talk to them and visit the turkeys.